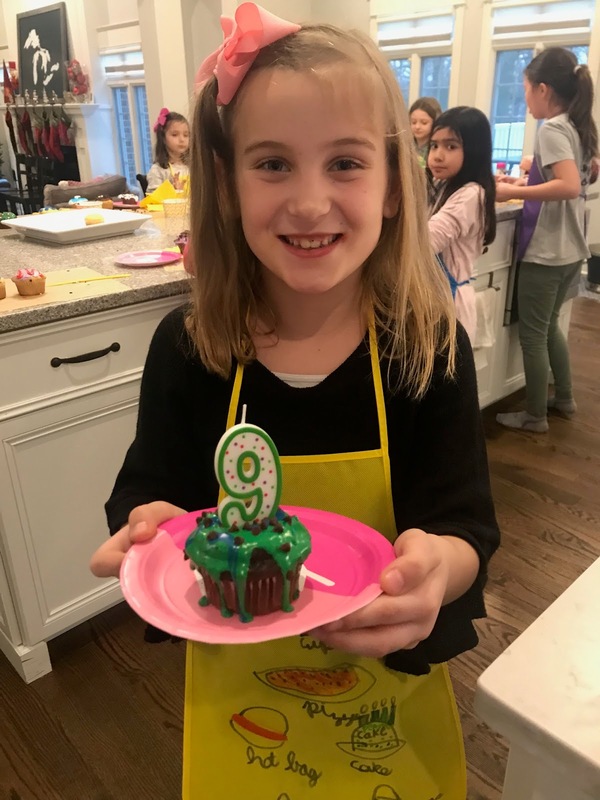 Three Kids and a Dog: Peyton Turns 9! It's been a crazy couple of weeks - hosting Xmas dinner, moving into our beach house in Michigan and then celebrating Peyton's birthday. Lots to do so little time! But, we did manage to give Peyton a birthday that I know she'll remember. 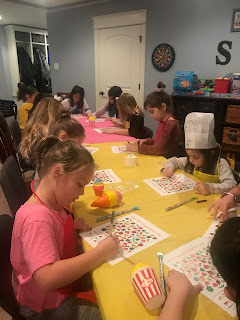 I always like to plan a unique birthday party for my kids especially for their "friend" parties. And, this year was no different. I tho ught a cooking party might be a lot of fun - after all there was this cute place in the neighboring town that did just that and would put on a healthy cooking party for a bunch of 8 and 9 year olds. Only problem was that it was "healthy." Peyton put the brakes on that pretty quickly when I showed her the menu of what they suggested. "I don't want that!" she whined. "I want pizza and cupcakes!" Pizza and cupcakes? Tom makes a really good homemade pizza that he's perfected over the years and it's pretty simple to whip up some cupcakes so I was thinking let's just have it at home. I could add some food related games, crafts and prizes and we'd be all set. Just more work for us the day after Christmas prepping the house (after just cleaning up from Christmas) and the food but probably a lot more realistic for what Peyton really wanted. I set the girls up in our dining room at first. All 11 of them plus Hailey so that made 12. They each got an apron and chef's hat to decorate while waiting for everyone to arrive. I placed "Would You Rather Questions" in mason jars around the table too if someone got done early they could kill some time asking these questions while others worked on their "art." 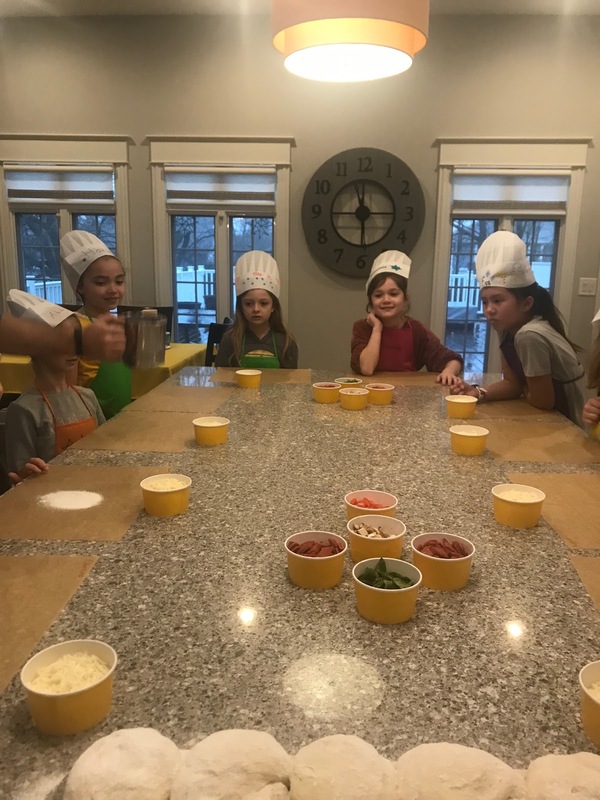 After the aprons and hats were done, we moved into our kitchen, where we could set up everyone around our big island to work on kneading out their own ball of pizza dough. 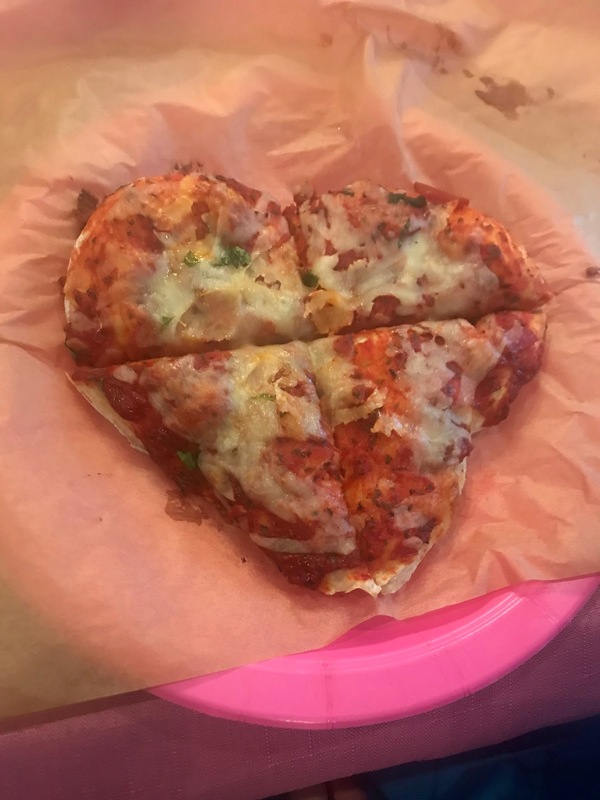 They worked diligently and creatively kneading out their dough and shaping it into hearts and perfect circles while adding sauce, cheese, spinach, pepperoni and other toppings. Once everyone had finished (and washed their hands), downstairs they went to play a variety of games from food bingo to I spy a vegetable to tell me what's a fruit or a vegetable. It was great fun and the prizes were a big hit and kept their interest in the games. Once the pizzas were all cooked, it was back upstairs to eat in the dining room. They all looked super yummy. And the girls devoured them quickly. 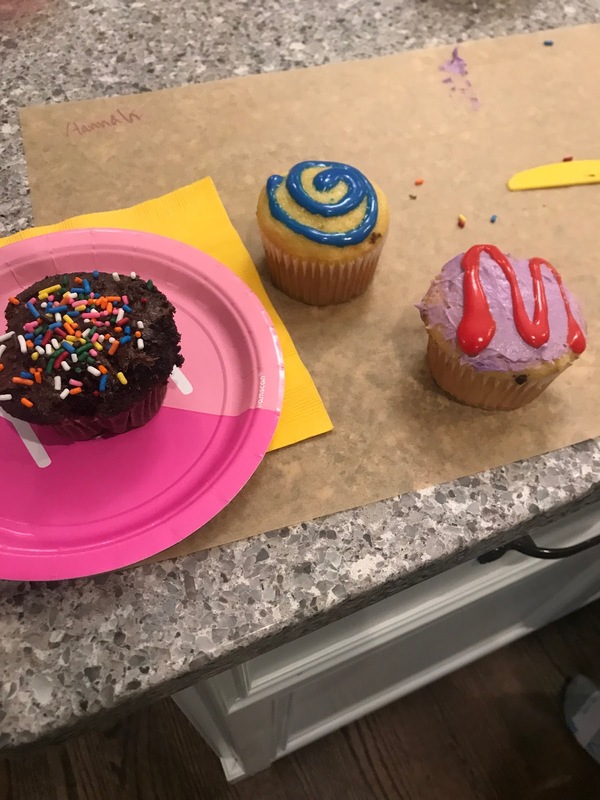 I guess they wanted to get to decorating their cupcakes. 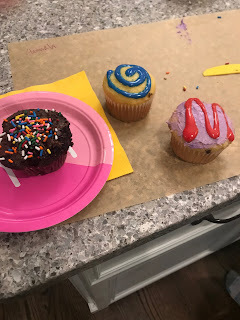 So it was back into the kitchen where we once again gathered around the island to frost the chocolate and vanilla cupcakes and add sprinkles and other decorations. 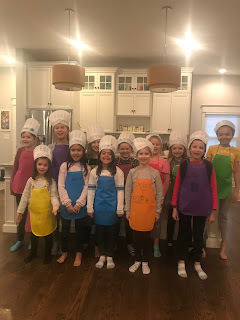 They packed up their extra cupcakes and then it was back to the dining room to eat one cupcake and sing to Peyton before the end of the party. 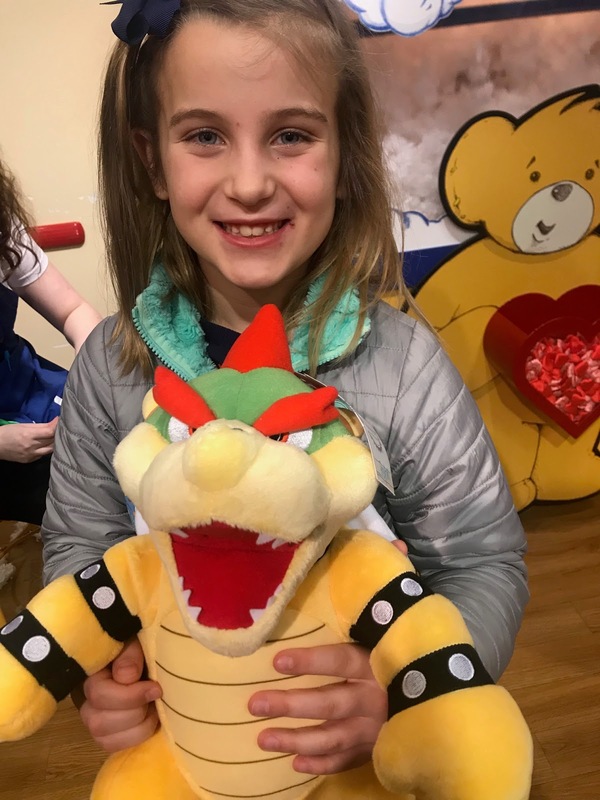 It was just 2 hours but the time flew by and Peyton and the girls all had a great time (including Hailey - and Austen who helped lead the games). 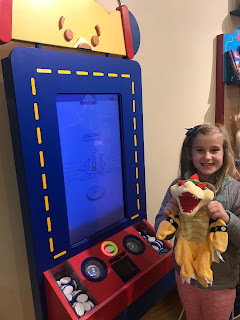 For Peyton's real birthday, we were in Michigan where she opened her presents including gift cards to Build a Bear from her aunt and uncle as well as Tom and me. We had looked up the location of a Build a Bear close to us and told her we were taking her there for the day too. She was so happy and declared it her best birthday ever! Success!